Do you want to represent your members more successfully in grievance meetings? Be more effective handling safety and health or other issues with management? Build a better working relationship with your supervisor? This class can help! We will examine effective responses to common supervisory styles; learn how to communicate more assertively with management; and practice presenting well-reasoned, compelling arguments in grievance meetings and other settings. Designed as a follow-up to the Basic Grievance Handling course. This class provides an overview of the arbitration process and techniques for preparing a case for the arbitrator. Learn about case theory, witness preparation and examination, opening statements, and issues of evidence and proof. This class is designed for union officers or chief stewards who are responsible for assisting in the preparation of arbitration cases. The one-day version is particularly useful for those who would like to know more about how the arbitration process works and how they can help to build strong cases. When offered as a five-day residential seminar, the program includes mock arbitrations which are presented before practicing arbitrators. The simulated arbitrations are taped and class members’ presentations are critiqued by the arbitrators and instructors. Getting folks involved in building union power can be fun! Traditionally, unions have generated creative expressions of our messages and missions. These include everything from the fabulous union buttons and slogans, to terrific labor songs and films, to giant puppets that can be taken out to demonstrations and parties. Arts in activism is a way to draw in members who may not be attracted to the drier and more technical aspects of unionism. They may not want to be at the bargaining table, but they are going to want to come to the party! Developing labor arts is also a way of drawing in families and community members, and creating space for diverse experiences as expressed in everything from music to food. This class will offer participants an opportunity to think about how to use arts as an organizing tool, and even to develop some of the specific skills to lead. Want to write a fantastic union rap? Design a great union sign? Build an amazing union float? This is the class for you! Unions are places to fight for justice for members and other workers. This struggle has often focused on wages and benefits, but it can be broader. Today there is increasing concern about racism, sexism, homophobia, anti-immigrant sentiment, and other kinds of exclusionary beliefs in our society generally. These kinds of negative stereotypes can lead to discriminatory practices at work that unions are in a great position to fight against. Sometimes, though, this outward struggle has to start with getting our own house in order. This class will offer participants skills to understand the importance of inclusionary leadership within our unions, and concrete ways to build equity and inclusion within our unions and in our workplaces. Bully bosses, tension between coworkers, harassment and even violence—these are situations that occur with alarming frequency in our workplaces. Such harassment might be based on gender, race or ethnicity or sexual orientation, raising issues of legal as well as contractual solutions. This workshop will help you recognize bully bosses and give you strategies for dealing with bullies and other workplace harassment issues. Success in negotiating your contract requires knowing what your members want, organizing them to show their determination, researching and preparing persuasive arguments on the issues, using the labor laws effectively, and bargaining skillfully at the table. This class introduces all these aspects of the collective bargaining process. This class may cover public sector or private sector only. When offered as a five-day residential institute (Collective Bargaining Institute), the program includes mock negotiations. The simulated negotiations are taped, and class members’ presentations are critiqued by experienced instructors. As a union activist, you do a lot of communicating. How do you make sure your message is transmitted accurately and that you correctly interpret the response? What preparation do you need to have a persuasive argument? In this class we will explore the elements of clear, effective and persuasive communication in both written and spoken form. We’ll discuss grievances, letters, reports, emails, personal conversations, and speaking out in meetings. Come prepared to practice and improve your skills. This class is designed to help building trades organizers learn how to organize and win new contracts in the construction industry. We will look at how to pick a target, how to build market share, and how to run a campaign that includes both top-down pressures and bottom-up organizing. Successful contract negotiations require the development of a strategic action plan that includes involving members in actions to demand a fair contract; and a strategy for pressuring employers to do the right thing. This class will provide training in analyzing the employer, mobilizing members, and coordinating what happens at the negotiating table with the campaign away from the table. We will go through the steps involved in successful contract campaigns in both the private and public sectors, using examples from real campaigns. In this class, participants will discuss the key challenges and critical issues facing workers and unions today. What can we learn from labor’s recent wins and losses? How do we rebuild labor’s power and standing in the community? And what do the changes in today’s workforce, economy, and labor structures mean—it’s not your father’s labor movement, but why does it matter? This “Big Picture” class will discuss and grapple with the implications of these developments for effective union activism and leadership. Want to get your union’s story out to the public? This class is designed to give unionists a better understanding of how the media works and how to get the union message out. All components of building a media campaign will be covered, including how to: identify ‘the public’ that you want to reach, write press releases, talk to reporters, and conduct an interview on TV or radio. Have you ever wanted to know your legal rights at work – apart from what’s in your union contract? Have you ever tried to defend a co-worker, but not been sure eactly what they’re entitled to under law? This workshop will provide an overview of the most important employment laws affecting Oregon workplaces, including anti-discrimination law, the Family and Medical Leave Act, and basic wage and hour regulations. An effective leader needs to be able to lead group discussions in a way that promotes honest participation and respectful interaction among the participants but also leads to a clear plan of action within a reasonable period of time. This workshop will give you the basic skills of how to draw out and build upon the experiences of participants, be inclusive, lead good discussions, summarize what was said and move the agenda forward. It will feature hands-on practice dealing with challenging situations, and practical solutions that can be used in facilitating meetings, classes and other group events. What is the union movement all about? What are the values that we believe in and what is the message that we present to others about our beliefs? How can we communicate our values and develop strong messages that can be used more effectively in the areas of bargaining, politics, and community action? These are important questions vital to enhancing the strength, credibility, and public image of the union movement. The class will focus on how to “frame” issues effectively and counter the ways in which others use “frames” to distort the image and message of unions. Participants will examine how unions currently frame important issues and work on developing concrete plans and strategies that more effectively present issues and messages to the key audiences the union is trying to reach. The class will enable activists, leaders, and staff to become more effective advocates for union values, ideas, and principles. Are you interested in learning how to investigate grievances. . .apply standards of discipline and discharge. . .use grievances as a union-building tool. . .present cases to management? This class is for union members, stewards, and officers who would like an introduction or a refresher on these essential union skills. An advanced class is also offered which focuses on effective strategies for investigating analyzing and presenting complicated grievances. This advanced class is more appropriate for stewards, officer and staff with grievance handling experience. To survive and grow in tough times, unions need power! Power in the workplace means a membership that is mobilized to fight for a fair contract, works together to solve problems at work and to build unity among the employees, and is informed about and active in the life of the union. This class will help identify why members aren’t more involved and will explore concrete ideas for building member participation and union power. An advanced version of this course is also offered, designed especially to be offered in connection to a specific workplace campaign. This course introduces union members to the basics of labor law covering both public and private sector employees. Topics include organizing and the law, unfair labor practices and protecting the rights of union activists, and legal issues surrounding contract negotiations. The class is designed to demystify the law and give all union activists more tools to run effective campaigns for union recognition and negotiating fair contracts. Does history really tell us anything concrete about how to shape labor strategies for today? 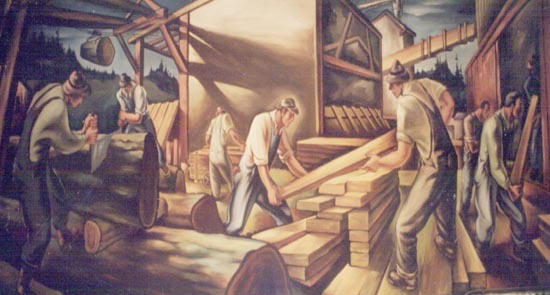 This class will examine winning and losing labor struggles since World War II, and analyze what they tell us about developing strategies today. We’ll look at victorious strikes and lost strikes; at legal strikes and some illegal wildcats; at union political and legislative victories and defeats; at successful corporate campaigns and unsuccessful ones. Some events covered will include the 1959 Oregonian strike, the 1970 postal wildcat, the PATCO strike, the J.P. Stevens and P-9 contract campaigns, the Oregon minimum wage initiative of 1996 and the current struggles and events of interest. This is the second of a two-part class, and covers the era from World War I until the present. Through exercises, lecture, discussion and film, participants will examine some of the major themes and events in twentieth century labor history. Topics include the rise of scientific management, 1920’s repression and the renewal of the labor movement in the 1930’s, labor during the war, the post-war “Accord,” the rise of public employee unionism, labor and the civil rights movement, and the anti-labor offensive of the 1980’s. The class will cover national labor history as well as the history of Oregon’s unions. This class will examine the most important political issues facing Oregon workers. We will look at how the political system really works, and how union members can gain more influence in the decision-making process. The course may include presentations by some of the key political players in the Oregon labor movement. No previous knowledge or experience is necessary—this class is designed to enable all union members and activists to participate effectively in the political process. Is your union having problems recruiting stewards? Have you got fewer and fewer activists doing more and more of the union work? Are you worried about keeping your union strong as established leaders retire or reduce their activity? This class will tackle these problems by examining new ways to identify, recruit, and develop local union leaders from among your union’s interested members. We will discuss strategies for reaching out across all generations in your union to increase the interest and expertise of newer activists and to bring new ideas, perspectives, and energy that promote the union’s values and goals. Whether you chair them or attend them as a member, union meetings are a fact of life. If they’re effective, they can help build the union; if not, they can contribute to member apathy. Learn how to improve your own meetings with solid preparation, an action orientation, efficiency, involvement, and follow-up. The class will also cover the basics of Parliamentary Procedure and alternative rules for smaller, informal meetings. An important skill for union activists and leaders is the ability to help resolve problems among our own members. Mediation is a structured process we can learn to help diffuse conflicts in a workplace and bring about mutually acceptable solutions-before a problem escalates or results in discipline. Mediation can also help deal with issues inside the union and build unity. This class will focus on establishing the proper climate for mediation, helping the parties listen to each other, identifying underlying interests, and moving toward a resolution. This course covers the why’s and how’s of union organizing. Why is organizing unorganized workers crucial to the survival of the labor movement and workers’ standard of living? How do union organizing campaigns work? What is the legal framework for organizing? What are the new strategies and approaches being tried by labor around the country? These and other questions will be addressed, and the role of union members in supporting their organizations’ organizing efforts will be explored. The Politics of Immigration: What Should Unions Do? The global economy and trade deals like NAFTA have had major effects on workers, unions, and communities and have prompted large-scale immigration to both Oregon and the U.S. Unions are now figuring out how to respond to the challenges posed by immigration. The experience of immigrant and refugee families, and that of communities experiencing an influx of immigrants, have generated controversy politically and in the workplace. This class will investigate how immigrants contribute to the building of our economy and the richness of our communities and explore the complex politics of immigration. Participants will gain insight into how they can present and discuss immigration issues in their unions and learn more about the strategies unions are using to reach out to immigrant workers. Learn more about the ideas and techniques of education for worker empowerment as it is practiced in the US today! Popular education is a form of social change education that builds on what workers already know, giving them a chance to practice new skills as well as to think critically about the world around them. The class will cover course planning, using forum theater and other activities, and facilitating good discussions. Designed especially for union and community activists with responsibility for training in their organizations. This course introduces unionists to basic public sector labor law under Oregon’s Public Employment Collective Bargaining Act (PECBA). It focuses on maximum effectiveness under the law while maintaining a grassroots organizing approach to workplace problems. It addresses organizing and the law, unfair labor practices, activists’ rights, legal issues in the collective bargaining process, and recent changes in the act. Would you rather do just about anything than speak in front of a group? Do you freeze up or stumble when asked a hard question in a public setting, even though you know the answer? Do you wish you could have communicated more effectively when you gave a report at your last union meeting? Clearly, union activists and leaders need to be able to communicate effectively in a variety of settings. This class will help you prepare an effective public speech, learn how to tailor your message to a particular audience, and offer tips on how to overcome your fears about public speaking. We will practice techniques to help you feel more confident and in control, whether you are speaking to a co-worker, at a union meeting, or at a public event. This class is designed for those who want to conduct campaign research in unions or other social justice organizations, either voluntarily or in a staff capacity. It provides participants with a general overview of the uses of research in bargaining and organizing campaigns, concrete examples of applied research, and opportunities to practice research strategies and methods. Participants will learn the techniques of corporate research, including sources of information available locally and online. A class for new and aspiring leaders! This class will address challenges facing unions today and implications for union leadership. You will identify your own leadership style, learn about working with and motivating union members, consider new leadership strategies and techniques, and discuss issues of power and ethics in unions. In addition to handling grievances under the contract, the effective union steward is a workplace leader: teaching workers how to assert their rights under the contract and organize support for the union. This class emphasizes these components of the steward’s role in addition to the basic technical aspects of contract administration. Through case problems and role plays, participants will explore how to identify and mentor new leaders and how to organize solidarity activities. Students will explore their own strengths as leaders and identify areas where they can expand their skills and inspire others. Stress—there is no shortage of it in today’s fast-paced, short-staffed workplace. It can become “toxic” for workers, leading to chronic illness and injuries. What are the stressors we face in our jobs and lives—and what do they do to us? More importantly, what can we do about it? This class will explore individual and collective (union) strategies to eliminate, reduce and cope with workplace stress. We all need balance in our lives. And part of being an effective union leader is being a good role model so that others want to join our movement. This class will help us find ways to set priorities, manage our time more effectively, combat stress, and to say “no” without guilt to some of the demands on our time. This class is designed for union officers, staff and education committee members responsible for training local union stewards Participants will review the steps necessary to plan a training program, develop an instructional agenda, and design classroom materials. Students will explore the wide range of classroom techniques used in labor education including icebreakers, individual student exercises, group exercise, role playing and audio visual aids. Participants will also get a chance to try out their own material and approaches in presentations to class members. Unions have long been one of the main advocates for better safety programs at work. Unions push for effective legislation but also operate at the workplace with worker activism. Oregon is one of the few states that requires work site safety committees and they are a great way for unions and workers to be involved in workplace safety. Learn about legislation and union activism for worker safety. Budget shortfalls, growing inequality, job loss, globalization, and changing corporate structure and strategy. If you’ve been looking for a clear explanation in plain English for how the economy works, this is the class for you. We’ll discuss problems in the American economy and their impact on our jobs and pocketbooks. We’ll evaluate real world solutions and discuss how unions can organize to build economic reform that’s good for working people. Facebook … Twitter … web conferencing … flash mobs… The explosion of social media in recent years has opened up new opportunities to engage members in the life of their union. When combined with solid internal organizing strategies, these tools can attract a new generation of unionists, increase two-way communications between leaders and members, and bring excitement and creativity to union actions. This course will provide an overview of what’s possible, with hands-on practice. Designed for those new to the technology, and for those working to bring new tools to their union.